Big things are happening in our neck of the woods. Big bike things. It seems that Big Dog has outgrown Mr. Orange, his trusty 16" bike and is ready to size up. At the same time, Little Dog is ready for a bicycle, ready to leave the trusty Kettler trike behind and ride with the big kids. The weather in Seattle is starting to act a bit more like spring now, so we're getting some sunny days and enough clear skies to make me dream about biking to work again. 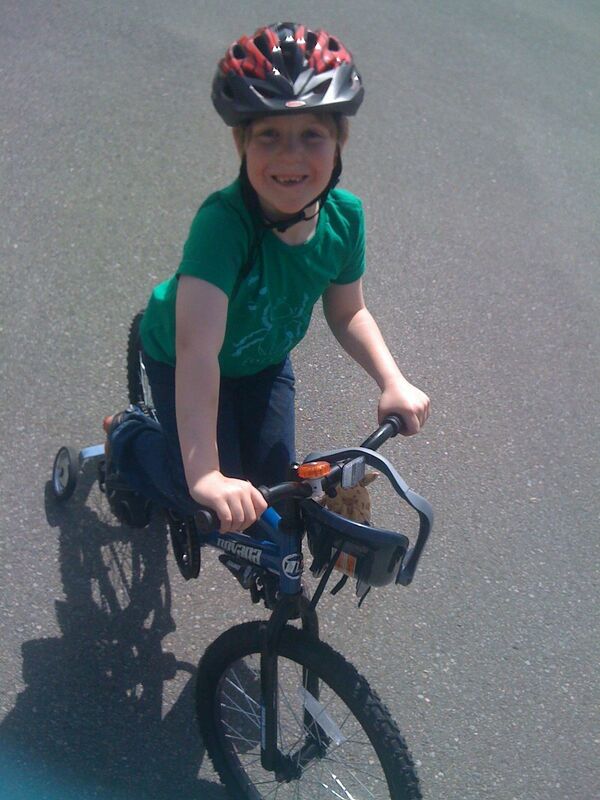 In this spirit, I agreed to a playdate this weekend involving bike riding. Big Dog's friend Sadie and her little brother Leo are just about the same ages as the boys, and in our past few visits, they all get along. Even when they're all together. Even when the younger boys want to play with the bigger kids and even when they don't. It's creepy. But creepy in a really really great way. The added bonus is that I really like their mom. I enjoy hanging out with her as the kids do their thing. And we get to hang out for a long time because there is so little drama, so little fighting and so much fun. It's kind of awesome. After our way too long shopping trip to REI, we headed home with new helmets, the horn and Mr. Flame, Big Dog's new blue bike packed into the station wagon. In fact, Big Dog wore the helmet out of the store and into the car. 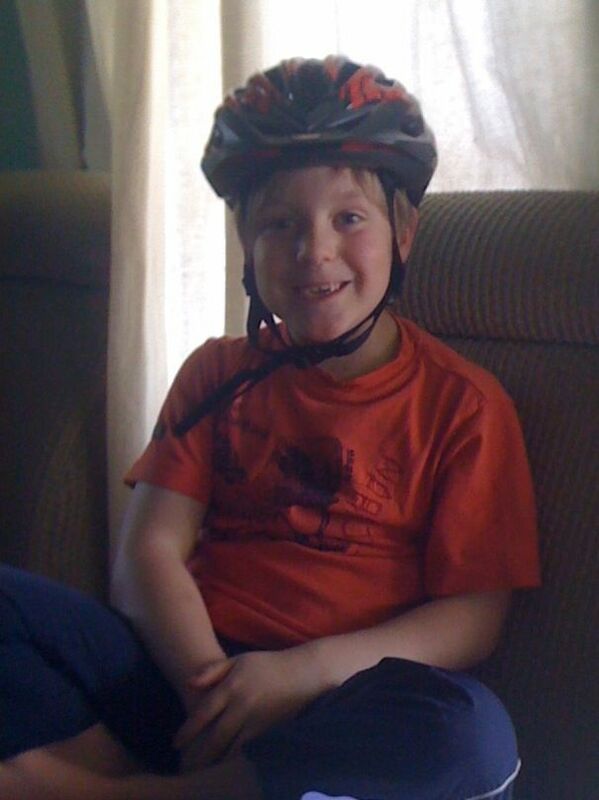 He then told me he was going to sleep in his clothes and shoes with his helmet on so all he had to do in the morning was "get on my bike and ride!" 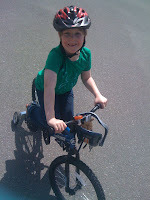 As soon as we got home he wanted to ride this new bike to "test it out for speed!" Unfortunately it was raining. During a break in the rain later that evening, he got to test ride one time down the street and back while Mr. Dog supervised which Big Dog told him was not enough "extercise." 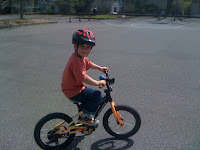 I began to worry about the viability of our planned playdate the next day, how long would it be before he'd be able to give the bike a proper test spin? Luckily, the weather forecasters had it right. As improbable as it seemed, today was a beautiful sunny day, barely a cloud in the sky and lots of welcome sunshine making Seattle one of the most beautiful places on earth. This was especially lucky since Big Dog, who did not wear his helmet to bed, did put it on pretty much immediately after getting out of bed even though our playdate was not until noon. Big Dog immediately took to Mr. Flame and though he says the new bike is "a bit wobbly" he also says "but I can handle it!" Little Dog focused his energy on riding his new-ish bike, Mr. Orange. After a bit of a stop-and-go start he got the hang of it, and before long he was biking along with the other kids as though he'd been riding a bike for ages. He still had a bit of trouble with the idea of backpedaling with the coaster breaks to stop, but he got it in the end after telling me, his voice filled with frustration, "I guess I'm gonna need a little lesson." I see a spring and summer filled with lots of biking. I just hope I'm going to get to join in the fun at some point instead of just being the lady who brings the picnic and transports the bikes from place to place. And if you're guessing that I wrote about this mostly to post photos of the boys on their new bikes, you'd be guessing correctly. Very cool! Our neghbours little boy wears his bike helmet all the time, so funny!